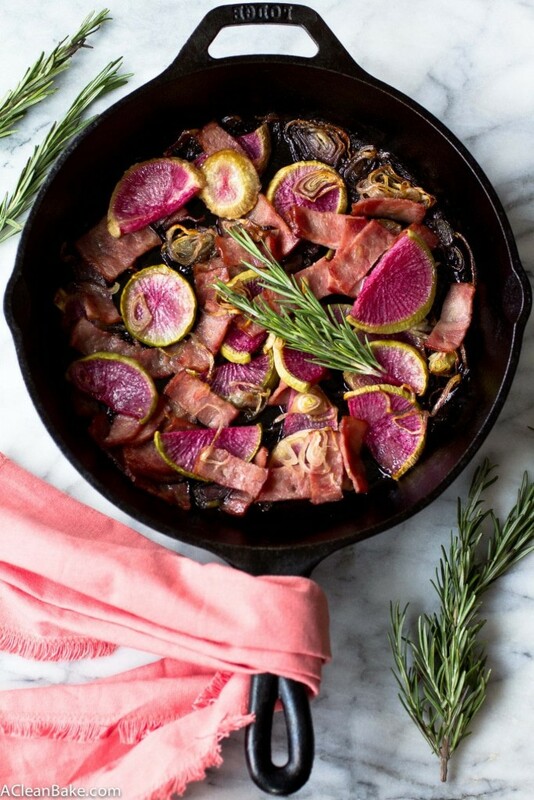 Maple roasted turnips are complemented by salty bacon and crispy shallots, and this easy one-pan dish is a perfect side dish or brunch! Butcher Box is offering A Clean Bake readers a bonus of free bacon with your first box, plus $10 off and free shipping! Sign up here. When you were a kid, did you ever read those American Girl books? Molly was my favorite. That was, of course, back in the day when there were only 3 AG dolls, not a rotating cast of thousands and glossy outposts on some of the highest-rent streets in the world. Ah, the humble, pre-Mattel American Girl days. Back then, it was easy to choose: you were either a Kirsten (blond, hearty, sporty), a Samantha (glamorous, possibly-but-not-necessarily brunette, probably popular), or a Molly (nerd, allergic to sports, glasses mandatory). I was a Molly (no pictures. long ago had them all destroyed. DO NOT LOOK FOR THEM.). No matter how old I get, I will never stop associating turnips with Molly. If you’re either not familiar with the books, or don’t have a mind that holds on to useless trivia like a steel trap (but releases important information like names of people you just met 20 seconds ago) like I do, here’s the gist of it: Molly’s story takes place in the middle of World War II, during which time food was rationed and people grew a lot of what they ate. Molly’s family is having turnips for dinner, and Molly is not allowed to leave the table until she finished them which, of course, she’s having trouble doing because they’re – in the book, according to Molly – terrible. Until someone – her mom? her housekeeper? I dunno. The books are packed in a box somewhere and I don’t feel like digging them out. – surreptitiously reheats her turnips with some (forbidden! highly rationed! worth its weight in gold!) butter and sugar, thus rendering the turnips palatable and an entire generation of young women highly suspicious of this root vegetable that they probably hadn’t ever tried for themselves before. If you were a mousy, brown-haired, bespectacled child, Molly was your leader and if she didn’t like turnips, then turnips were dead to you. But with all due deference to Molly, I don’t know where her turnips came from because once I finally tried turnips, I was surprised to find them appealing. More than appealing, actually: delicious. Like most root veggies, their starches roast up into a sweet, tender bite that only needs the slightest encouragement from some fat (olive oil, in this case) and natural sweetener like maple syrup, to caramelize the outsides. 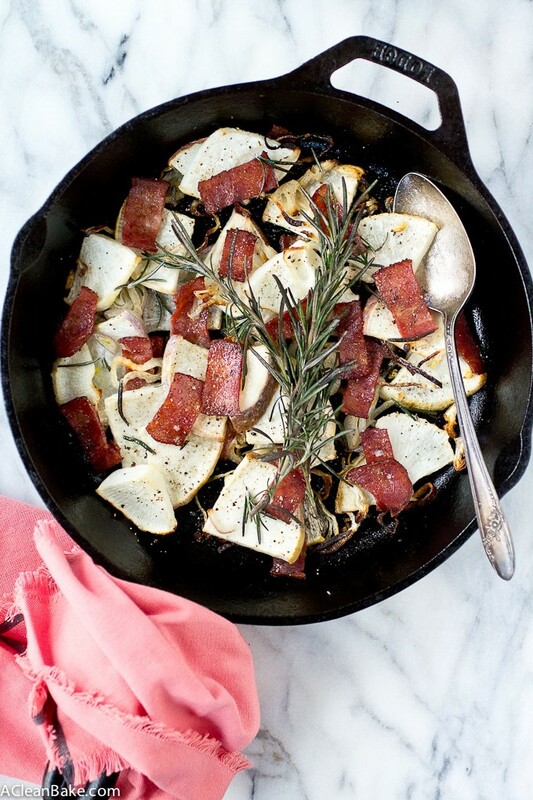 If you like roasted carrots, give turnips a try too. And what’s not to love? Besides a little peeling and chopping, it’s mostly just a bit of hands-off cooking time standing between you and a delicious and healthy-ish (we’re counting bacon as healthy, right? I presume yes?) one pan dinner. Plus, of course, there’s bacon. PS: I made this recipe several times using Hakurei (white) turnips, but added some watermelon radishes to the final batch for variety and, I admit, visual interest. You can mix it up however you want, if you want, by mixing the turnips with radishes, carrots, or almost any other starchy root vegetable you can think of. Or you can follow the recipe and use all turnips, and it will still be delicious! Preheat the oven to 400F. Add 1 Tablespoon of olive oil to a large oven-safe pan or baking dish (cast iron is best) and swirl it around to coat the bottom of the pan. Set aside. Place the prepared turnips in a large mixing bowl. In a small mixing bowl, whisk together 1 tablespoon of the oil, the maple syrup and the sea salt. Pour maple syrup mixture over the turnips and toss to coat. Transfer the turnips to the prepared pan, then sprinkle the shallots over the turnips. Bake for 15-20 minutes, then add the bacon and toss to combine all of the ingredients in the pan. 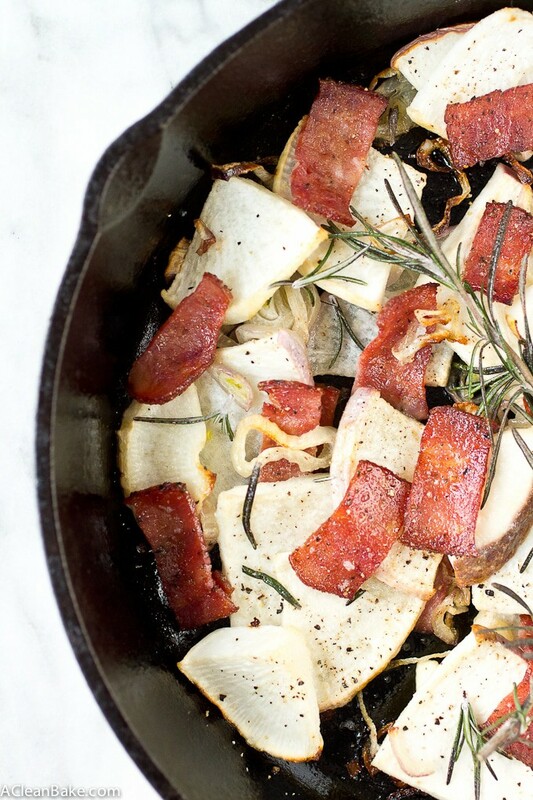 Bake for another 20-30 minutes until turnips are soft and bacon and shallots are crispy. 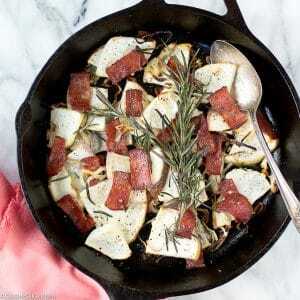 Remove from oven, sprinkle with fresh rosemary, and serve immediately. Leftovers make an excellent breakfast, especially topped with a fried or poached egg. I made this recipe several times using Hakurei (white) turnips, but added some watermelon radishes to the final batch for variety and, I admit, visual interest. 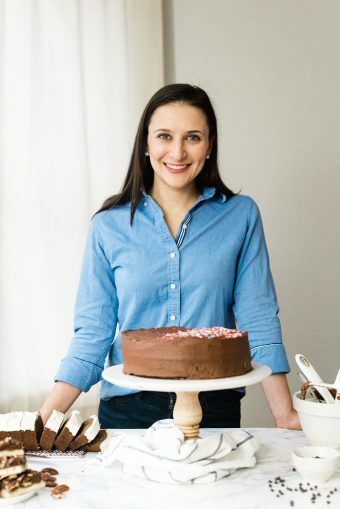 You can mix it up however you want, if you want, by mixing the turnips with radishes, carrots, or almost any other starchy root vegetable you can think of. Or you can follow the recipe and use all turnips, and it will still be delicious! Yield: Approximately 4 servings, but it all depends on how hungry you are. Clicked through for the recipe, got a lovely trip down memory lane as a side. I had a Samantha, because I was weirdly obsessed with the Victorian era. My grandmother used to sew matching outfits for her and me! 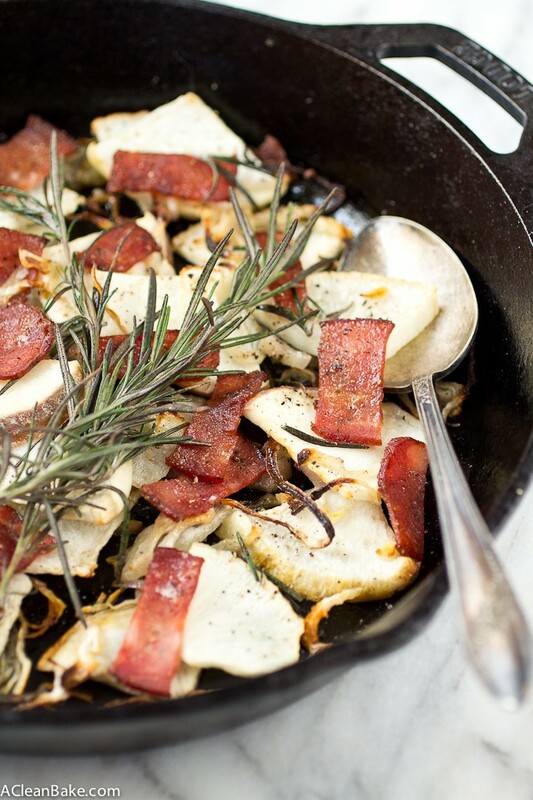 Life was good — as is this recipe, full of my fave foods: root veg, MAPLE SYRUP, fried shallots, salty bits of cured meat. I was always jealous of the girls who had Samantha! I always felt like I wasn’t glamorous enough to own her. :-p Life WAS good when you could hang out with your doll in matching outfits and feel like a boss, wasn’t it! 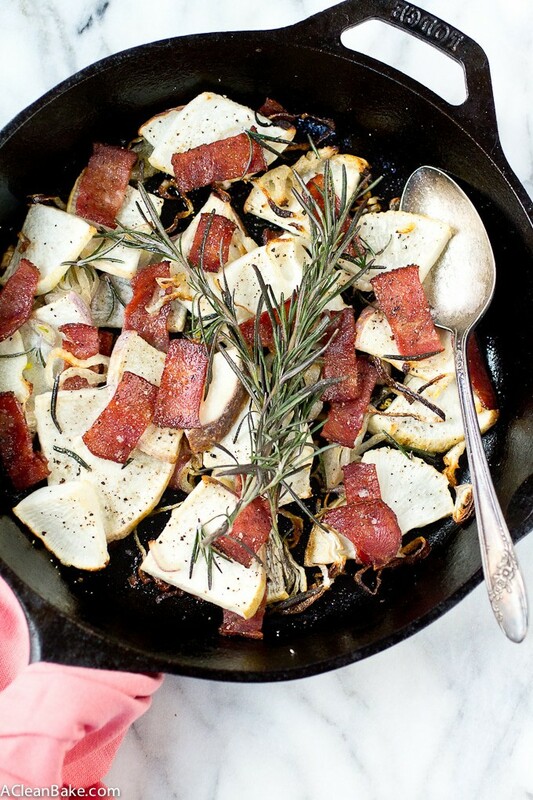 The picture may be the issue BUT your turnips look a lot like watermelon radishes…. I added some watermelon radishes for the photos, for visual interest. You can use all turnips (I used Hakurei turnips) or a mixture of root veggies. I added some for the pictures, but mostly I used Hakurei turnips. You can use almost any root veggie in this recipe, actually. Your photos are beautiful and this looks so delicious! Pinning! Hahaha AMERICAN GIRL! I was a big of fan of Abby, what a throwback! I had her too! Loved her! Aside from the watermelon radish vs turnip issue mentioned by others, I’m also confused at the ratios. 6lbs or turnips and 1 shallot? Doesn’t seem correct or like the picture displays in terms of quantity. Hi Vicki. It’s actually .6 lbs of turnips (2/3 lb). I just updated the recipe with the fraction to clarify. You can certainly use more shallots if you want, or if your shallots are particularly small. Unfortunately, I don’t know how large my shallot was, by weight, so I’d recommend one large or two small. I have also elected to change the name of the recipe to avoid future confusion.